Sometimes when you finish a jewelry project, you end up with a few leftover beads. Even if the colors work well together, you may not have enough to complete another large project. Or maybe the beads are different shapes and sizes. 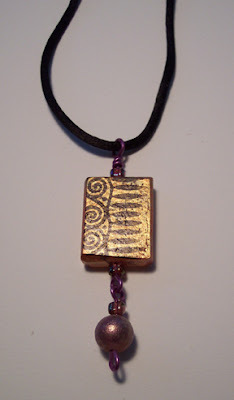 Here is a fun and quick asymmetrical little toggle necklace that's a great way to use up some of those leftover beads. This article was published in the July 2000 issue of Lapidary Journal, and is available on-line at this link, courtesy of LJ. How do you describe your work, Jamee? Fresh and Funky with an island twist. 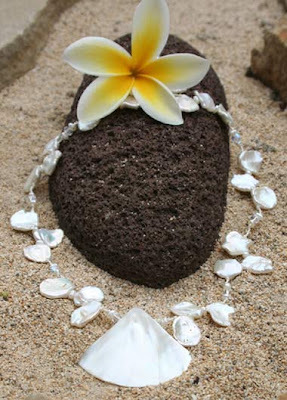 I also create romantic, feminine beach bride jewelry that has a beachy-organic appeal. Originally my sister Kimberlee Aihara partnered with me before she became a wedding photographer here on Maui and so Jonara is a mix of our last names: Jones and Aihara. Add the Blu to represent the blue ocean that surrounds us and we’ve got ourselves a cute little name for our jewelry business! I think creating is quite emotional for me..I really have to be in the mood to design my most favorite pieces that I’m extremely proud of. At times like that it’s usually late at night when I’m way over tired and I become inspired by color and the music on one of my playlists. I find putting together a piece to be sort of like a puzzle…finding the right balance between color and shape is very exhilarating and leads to more creative ideas. It often takes me from days to weeks to complete a piece as I come back and rearrange beads until it finally looks right to me. When in that ‘design mode’ you will find bead containers stacked all around me and probably 20-30 different strands and little piles of single beads strewn across my beading area. I end up using not even half of them when I finally make a decision. Usually whilst in the middle of deciding on what looks best for one idea I had..I often get inspired by the beads themselves and stick aside my original idea for another time because the excitement from the new idea is begging to be done right then and there. Of course being surrounded by such amazing beauty here on the island of Maui goes with out saying..it’s a constant inspiration that is always there for me to pull from. The many brightly colorful flowers are a big inspiration, the ocean and it’s sea life and especially beach weddings. 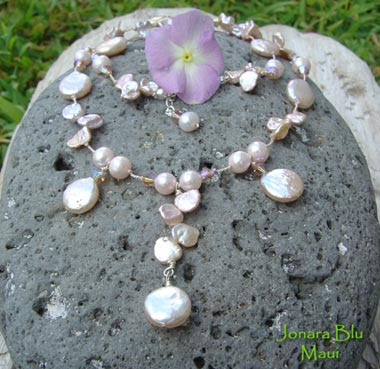 They really inspire me and have allowed me the opportunity to create jewelry for many of Maui’s blushing brides as well as other beach brides around the world. 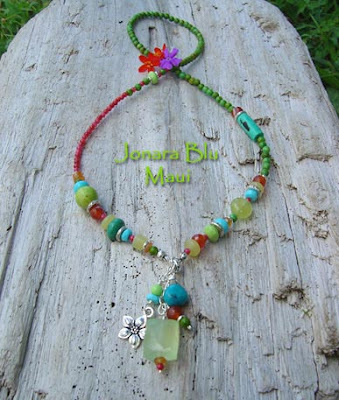 I started creating my first jewelry pieces when only 9 years old. I had this babysitter named Jenny who watched me and my brother on Monday nights while our mom and dad were at lamaz classes preparing for our little sister Kimberlee to arrive. Jenny would bring this shoe box over full of little bottles of beads and findings and she would teach me how to make necklaces. I was in heaven! At the end of the last day she watched us she gave me the whole box of beads! I still vividly remember the excitement I felt as the new owner of those tiny colorful candy-like wonders and I often pull that memory out when my hobby has started to feel a little too much like work. And I am both happy and proud to say that is exactly what my hobby has become…my job! 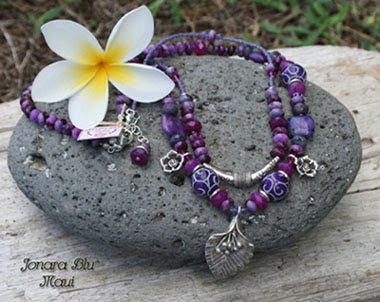 In 1996 I started working for a local Maui ceramic jewelry artist. Having taken many art classes and having the knack for painting, I picked up right away on how to paint intricate designs on ceramic beads for this artist. 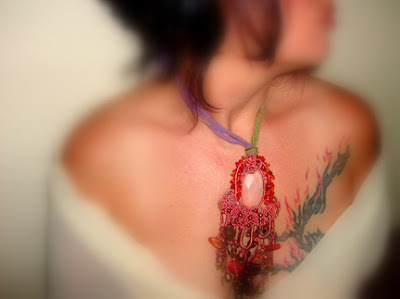 I was also trained how to string the very well made heavy jewelry designs that this artist sold in local galleries. Having learned a little about the business side of jewelry making and being constantly inspired with new ideas for my own line, in 2002 along with my sister Kimberlee (because of course I taught her all about beading as a kid), I branched out on my own, selling at local craft fairs. May of 2003 I launched my online shop through RubyLane and since then I have added my Etsy shop and have enjoyed becoming part of the Etsy community. My sister Kimberlee left the world of jewelry making a few years ago to pursue her very successful wedding photography business. I cannot imagine living without pearls…they really speak volumes of time and natural beauty and are a lovely reminder of the sea. 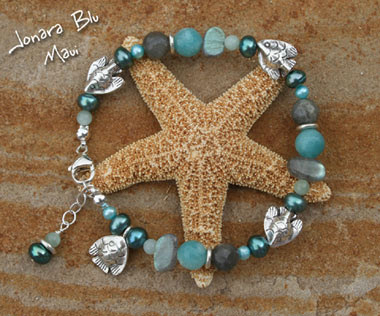 My other favorite is Hill Tribe silver sea creature and ocean themed beads and charms. Besides what I mentioned above...just remembering my original excitement for the craft and fascination of beads themselves..some of the other things that inspire me to keep going is seeing what others have created, hearing how much people enjoy my pieces, the friendship it’s brought me from meeting fellow beaders and getting to know special customers, and also the ability to help my family out financially. Sometimes when I need a real kick in the pants I look over my work and accomplishments as a reminder to what I am capable of. Well I am kind of all over the place and have a hard time focusing when it comes to learning new things. So I would have to say take a class if you can..it helps you to focus. I collect tutorials and purchase videos and can’t seem to ever actually sit down and do it. A class has set a definite appointment for you to spend time on that new aspect of your craft..plus it’s fun and inspiring to spend a few hours w/ others interested in the same thing. I would have to say my family and spending time with them. While creating it’s easy to bury myself in my studio and not come out for hours..but I have made it a point to always spend family time throughout the day. Family time is addicting..so I often find that I have to pull myself away from them to get back into beading mode again! Comfort food: Chocolate…Dark…always gotta have dark chocolate! My favorite color believe it or not since I was 5 years old was black. I used to get teased in school about coloring w/ the black crayon and told that only boys liked that. I liked other colors too, but I liked the way black made the color look. I remember my kindergarten teacher showing my mom a picture I colored. We all had to color a star…my star was black with multiple colored flowers growing out of it and evidentally the teacher thought it was pretty nifty. Since then my tastes have changed and I can’t say I really have a favorite color…I love them all and how each one can have an effect on the other. 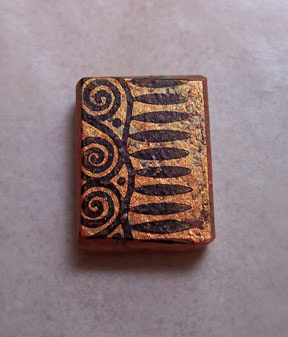 One of my favorites to work with though is brown…I like to put it along with a bright color combination. 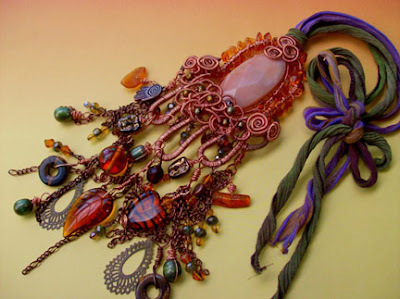 Mom’s bizarro bracelets…That “what-was-I-thinking?” necklace… Aunt Bertha’s big glunky brooches. 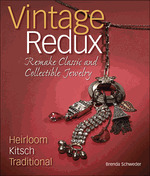 Vintage Redux shows readers everywhere how to take a drawer full of jewelry duds and turn them into dreams. More than 30 projects, from traditional to totally over-the-top, offer readers a wide range of possibilities. Each project is presented in step-by-step instructions and photos so it’s easy to create all-new pieces. Revisit the past and make it better than ever before with Vintage Redux. After enjoying Brenda’s book Junk to Jewelry, I was anxious to get a hold of her newest venture. Well, I wasn’t disappointed. Vintage Redux starts with the simplest restringing and ends with sophisticated remakes that use power equipment (don’t get worked up…it’s just your drill or dremel!). It’s very unlikely that you will be able to exactly match and copy these projects, so don’t get the book if you like to have step-by-step detailed instructions. But definitely take a look at this if you’re looking for ideas to inspire your own creativity! 1. 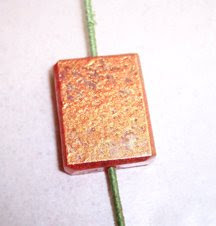 Slide a flat rectangle and a round resin bead onto a piece of scrap wire, and suspend it so that you can paint all sides. Using a small sea sponge, dab the beads with acrylic paints, drying between each color. Use a heat gun to speed up the process if desired. Don’t cover all of the natural bead color. 2. Stamp the surface of the flat bead using a solvent ink. Heat set the design well. Flip the bead over and stamp the other side too. Heat set. 3. 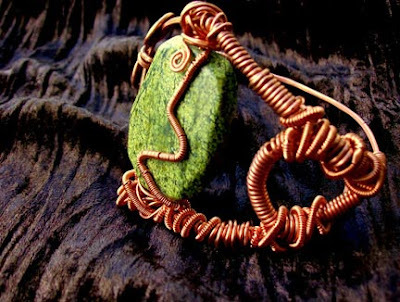 Cut a 4 inch piece of 18 gauge color-coated wire and make a wrapped loop at one end. 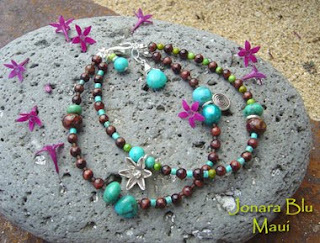 Slide a triangular bead, your stamped bead, and a second triangular bead onto the wire and close it with a simple loop. Cut a 1 1/2 inch piece of wire and turn a small loop at the bottom. Slide on the painted round resin bead and a triangular bead, and turn another small loop at the top. Attach the two free loops together.